Local Highland club associate member, Liam MacDonald-MacLeod, whose home club is Royal Dornoch, completed a unique hat-trick this season when he retained the Brora Five Day Salver with a thrilling last-green win over Prestwick's Dougie Brown in the final. Already with three back-to-back Brora club championship wins earlier in the year, MacDonald became the first golfer to win the scratch salver two years in a row since the inception of the tournament in 1972. It was launched as a summer visitors' and members' attraction the week before the Carnegie Shield at Dornoch and in the first three years was won by the outstanding local member Jim Miller. For my generation it is still affectionately referred to as “The Ainslie” from the name of its first sponsors, Ainslie and Heilbron, an Edinburgh whisky retailer whose commercial brand was Royal Edinburgh, liberally dispensed free before and after rounds to all and sundry. The event received sponsorship from various whisky industry producers until Diageo and the local distillery pulled out two years ago. But for the past two years the club has been fortunate in finding a new sponsor by way of the neighbouring Royal Marine Hotel. From its early three-day beginnings in 1972, the competition has grown to five days with four sections of match-play, scratch and three handicap, plus a supplementary final for non-qualifiers. All week the clubhouse buzzed with “add on” entertainment and the golf course reaped praise for its condition under such a stressful dry summer for greenkeepers, but MacLeod's grip on the Salver nearly ended before the match-play stages began. He was on the verge of non qualifying with cards of 77 and 76 when an error was found on three time former winner Iain Powell's card, a 5 marked down for a 4 at one hole and as the 5 had to remain, the slip dropped Powell to 17th place and passed the last qualifying place over to MacLeod on his better second round. Seizing the opportunity the Dornoch member went out and comfortably beat the leading qualifier and W J Henderson Medal winner, David Sanderson (Nairn) (74-68) in round one and then KOd former winner Euan Polson (Royal Aberdeen) in the quarter-final. Brown had come out of a bunker to earn a half and take his semi-final tie to the 19th hole where he booked his final place against former Brora junior Gary MacDonald, now Cruden Bay, and son of Ronald MacDonald (Spar grocer), who followed Jim Miller's name onto the Ainslie Salver in 1975. MacLeod's game was a bit loose over the first two holes. Lucky not to be two down, Brown took a one-hole lead with a birdie putt on the third green. But the holder regained his composure with a winning par on the fifth hole. Then, after an exchange of holes, they turned for home level before a conceded eagle on the 11th put MacLeod in front. His three putt on the 14th and saving 9 foot putt on the 15th kept the tie level to the final tee where MacLeod found the putting surface and Brown went through the back, striking the electric fence on the way. Electing to pitch back rather than go back to the tee to replay the shot, his pitch was a bit strong. MacLeod got his par three and the Brora Salver for a third time when Brown's attempt from 12 feet hit the hole but did not drop. Two of the next three finals went the distance but one went an extra eight holes! For the McRobert Thistle Cup in Class 1 Golspie's club champion Colin “Scooty” Sutherland, following an excellent 4 and 3 win over local Calum Stewart in the semi-finals, took a talented young Edinburgh teenager Robbie Hawthorn (Royal Burgess) to the final green where Hawthorn won the last to win by two holes. Helmsdale-based Brora member Richard Sutherland, having lost three previous finals, was making a fourth attempt to win a final from the second group of handicap qualifiers and after winning two of the first four holes then lost his lead and the ninth hole to be one down. Sutherland was two behind after 11 holes but squared after 18 for the tie to continue outwards for another seven holes. 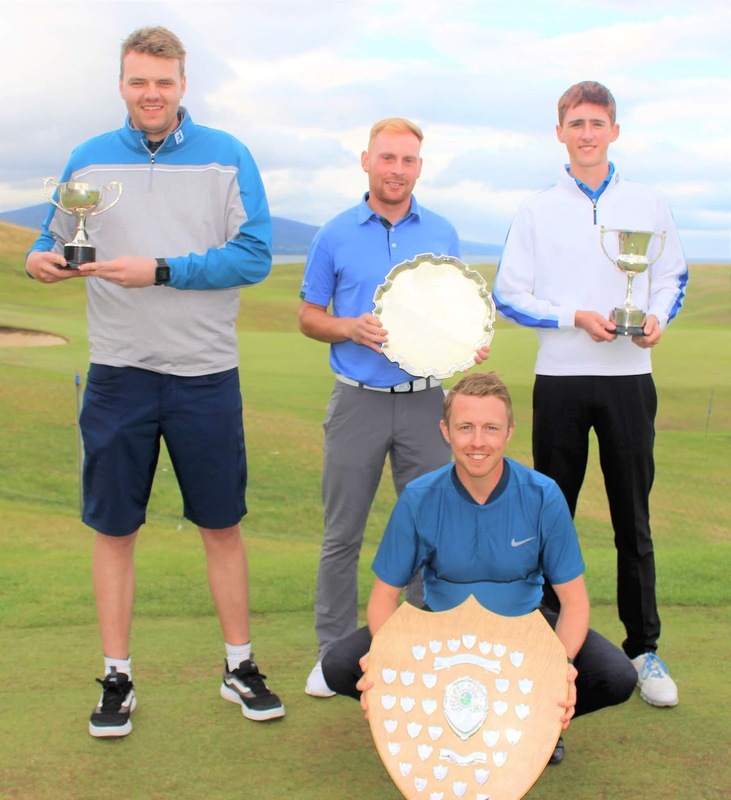 All were halved until the decision was made to turn and play back in from the 12th tee where they were separated by a par four from Grant Melvin from Ham Manor GC, West Sussex to win the Brora Shield. In third group of handicap qualifiers Marc Windsor from Fortrose and Rosemarkie won through to the final where he ran into a barrage of winning holes from Robbie Farrimond from Eaglescliffe Golf Club, Stockton-on-Tees. The visitor won the first two holes, then the seventh, eighth and tenth, losing only the third hole. Windsor, after visiting the burn at the 11th hole, avoided going five behind with a single-putt 5 but it only delayed the final winning outcome of 5 and 4 to Farrimond on the 14th green. First round - L MacDonald-MacLeod (Royal Dornoch) bt D Sanderson (Nairn) 5 and 4, E Polson bt D Doogan (Golspie) 3 and 1, J Paulus (Royal Dornoch) bt S Doogan (Golspie) 5 and 3, J Polson (Peterculter) bt A W Hawthorn (Royal Burgess) 2 holes, D Hexley (Golspie) bt R Powell (Murcar Links) at 20th, Cameron bt M G Smith (Wentworth) 3 and 2, D Brown (Prestwick) bt S Murray (Stirling) at 19th, G McDonald (Cruden Bay) bt R Naismith 4 and 2. Second round – MacDonald-MacLeod bt E Polson 3 and 2, Paulus bt J Polson 6 and 5, Cameron bt Hexley 3 and 2, Brown bt McDonald at 19th. Semi-finals - MacDonald-MacLeod bt Paulus 3 and 2, Brown bt Cameron 4 and 3. Final – MacDonald-MacLeod bt Brown 1 hole. Semi-finals – C Sutherland (Golspie) bt C Stewart 4 and 3, R Hawthorn (Royal Burgess) bt I Kennedy (Overstone Park) 2 holes. Final - Hawthorn bt Sutherland 1 hole. Semi-finals – G Melvin (Ham Manor) bt M Smith sen (Wentworth) 1 hole, R Sutherland bt P (Invergordon) 3 and 2. Final - Melvin bt Sutherland at 26th. Semi-finals - M Windsor (Fortrose and Rosemarkie) bt J Clarke 2 and 1, R Farrimond (Eaglescliffe) bt C Day (The Wisley) 3 and 1. Final - Farrimond bt Windsor 5 and 4. Semi-finals - C Wilson (Golspie) bt C Adamson (Lundin Links) 2 and 1, A Roe (Royal Burgess) bt S Yates (Ham Manor) 5 and 4. Final - Roe bt Wilson 4 and 3. Picture caption: Brora Four-Day Open prizewinners (left to right) Robbie Farrimond (Auchrioisk Cup), Liam MacDonald-MacLeod (Brora Salver), Rob Hawthorn (McRobert Thistle Cup). Front: Grant Kelvin (Brora Shield).